Consolidated net sales of $3.0 billion increased 6.1% in the quarter as reported and 6.9% in constant currency, as foreign currency exchange rates negatively impacted net sales by 0.8%. Excluding the 0.2% impact of acquisitions, net sales in the quarter increased 6.7% in constant currency, including 8.2% from increased unit volume partially offset by 1.5% due to lower prices. Orthopaedics net sales of $1.1 billion increased 5.5% in the quarter as reported and 6.5% in constant currency, as foreign currency exchange rates negatively impacted net sales by 1.0%. Excluding the 0.3% impact of acquisitions, net sales in the quarter increased 6.2% in constant currency, including 8.6% from increased unit volume partially offset by 2.4% due to lower prices. MedSurg net sales of $1.3 billion increased 6.2% in the quarter as reported and 6.8% in constant currency, as foreign currency exchange rates negatively impacted net sales by 0.6%. Excluding the 0.1% impact of acquisitions, net sales in the quarter increased 6.7% in constant currency, including 7.1% from increased unit volume partially offset by 0.4% due to lower prices. Neurotechnology and Spine net sales of $0.5 billion increased 6.9% in the quarter as reported and 7.9% in constant currency, as foreign currency exchange rates negatively impacted net sales by 1.0%. Net sales in the quarter increased 10.0% from increased unit volume partially offset by 2.1% due to lower prices. Reported net earnings of $391 million increased 2.9% in the quarter. Reported net earnings per diluted share of $1.03 increased 3.0% in the quarter. Reported net earnings include certain charges for the amortization of purchased intangible assets, Rejuvenate and ABG II and other recall matters, restructuring-related activities, legal matters and acquisition and integration related activities. The effect of each of these matters on reported net earnings and net earnings per diluted share appears in the reconciliation of actual results to adjusted results below. Excluding the impact of these charges increases gross profit margin in the quarter from 66.1% to 66.3% and increases operating income margin from 16.6% to 25.0%. Excluding the impact of the items described above, adjusted net earnings(2) of $581 million increased 10.7% in the quarter. Adjusted net earnings per diluted share(1) of $1.53 increased 10.1% in the quarter. We now expect 2017 organic net sales growth to be in the range of 6.5% to 7.0% and adjusted net earnings per diluted share(3) to be in the range of $6.45 to $6.55. For the third quarter we expect adjusted net earnings per diluted share(3) to be in the range of $1.50 to $1.55. If foreign currency exchange rates hold near current levels, we expect net sales in the third quarter and full year to be negatively impacted by approximately 0.5% and adjusted net earnings per diluted share to be negatively impacted by approximately $0.02 in the third quarter and $0.10 in the full year. (1) A reconciliation of reported net earnings per diluted share to adjusted net earnings per diluted share, a non-GAAP financial measure, and other important information appears below. (2) A reconciliation of reported net earnings to adjusted net earnings, a non-GAAP financial measure, and other important information appears below. (3) A reconciliation of expected net earnings per diluted share to expected adjusted net earnings per diluted share for the third quarter and full year and other important information appears below. As previously announced, the Company will host a conference call on Thursday, July 27, 2017 at 4:30 p.m., Eastern Time, to discuss the Company’s operating results for the quarter ended June 30, 2017 and provide an operational update. To participate in the conference call dial (844) 826-0610 (domestic) or (973) 453-3249 (international) and be prepared to provide conference ID number 26061645 to the operator. A simultaneous webcast of the call will be accessible via the Company’s website at www.stryker.com. The call will be archived on the Investors page of this site. A recording of the call will also be available from 8:00 p.m., Eastern Time, on Thursday, July 27, 2017, until 11:59 p.m., Eastern Time, on Thursday, August 3, 2017. To hear this recording, you may dial (855) 859-2056 (domestic) or (404) 537-3406 (international) and enter conference ID number 26061645. Stryker is one of the world’s leading medical technology companies and, together with our customers, we are driven to make healthcare better. The Company offers a diverse array of innovative products and services in Orthopaedics, Medical and Surgical, and Neurotechnology and Spine that help improve patient and hospital outcomes. 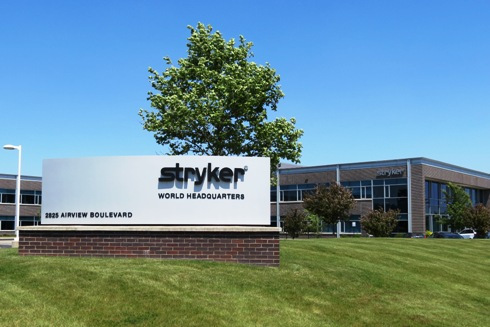 Stryker is active in over 100 countries around the world. 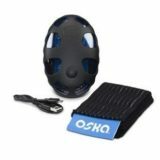 Please contact us for more information at www.stryker.com. We supplement the reporting of our financial information determined under accounting principles generally accepted in the United States (GAAP) with certain non-GAAP financial measures, including percentage sales growth in constant currency; percentage organic sales growth; adjusted gross profit; cost of sales excluding specified items; adjusted selling, general and administrative expenses; adjusted operating income; adjusted effective income tax rate; adjusted net earnings; and adjusted net earnings per diluted share. We believe that these non-GAAP measures provide meaningful information to assist shareholders in understanding our financial results and assessing our prospects for future performance. Management believes percentage sales growth in constant currency and the other adjusted measures described above are important indicators of our operations because they exclude items that may not be indicative of or are unrelated to our core operating results and provide a baseline for analyzing trends in our underlying businesses. Management uses these non-GAAP financial measures for reviewing the operating results of reportable business segments and analyzing potential future business trends in connection with our budget process and bases certain management incentive compensation on these non-GAAP financial measures. To measure percentage sales growth in constant currency, we remove the impact of changes in foreign currency exchange rates that affect the comparability and trend of sales. Percentage sales growth in constant currency is calculated by translating current and prior year results at the same foreign currency exchange rate. To measure percentage organic sales growth, we remove the impact of changes in foreign currency exchange rates and acquisitions that affect the comparability and trend of sales. Percentage organic sales growth is calculated by translating current and prior year results at the same foreign currency exchange rate excluding the impact of acquisitions. To measure earnings performance on a consistent and comparable basis, we exclude certain items that affect the comparability of operating results and the trend of earnings. (a) Charges represent certain acquisition and integration related costs associated with acquisitions. (b) Charges represent the cost associated with certain restructuring-related charges associated with workforce reductions and other restructuring-related activities. (c) Charges represent changes in our best estimate of the minimum end of the range of probable loss to resolve the Rejuvenate recall and other recall matters. (d) Amount represents gains or losses associated with legal settlements. OrthAlign, Inc., a privately held U.S.-based medical device and technology company providing orthopedic surgeons with advanced precision technologies, announced today a distribution partnership with Ortosistemas S.A. and the first set of KneeAlign® cases successfully completed for total knee arthroplasty (TKA) in the country of Panama. These cases were completed by Panama City-based orthopaedic surgeon Edmundo Ford, MD of Centro de Especialidades Ortopedicas at Hospital San Fernando and continue to demonstrate the rapid adoption of OrthAlign’s handheld precision technologies, by surgeons throughout the world (the technology is now utilized in over 45 countries). 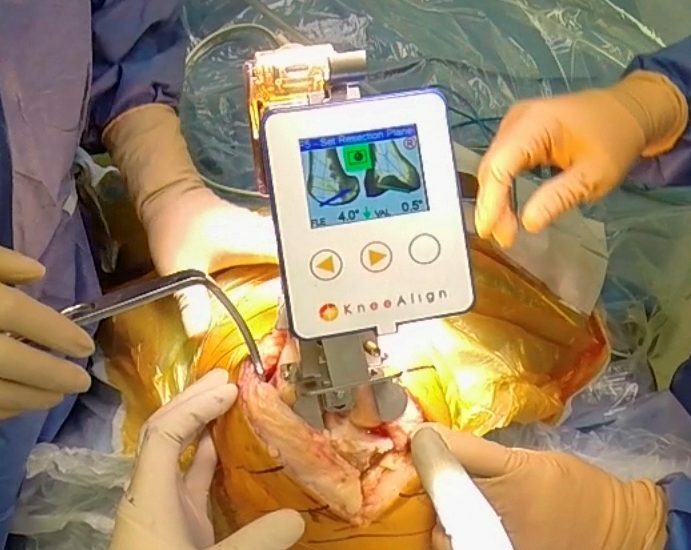 OrthAlign provides highly accurate, computer-assisted, handheld technologies for surgeons to receive real-time, actionable data for precise alignment and positioning of components in total knee, unicondylar knee, and total hip (both posterior and anterior) arthroplasty surgeries. Over 15 peer-reviewed clinical studies have been published to date, validating OrthAlign’s accuracy, simplicity of use, and benefits in recovery for the patient. Spineway, specialist in surgical implants and instruments for treating disorders of the spinal column (spine), announces that it is setting up an issue of Tranche Warrants for Notes with Warrants to finance the acceleration of its development. In accordance with the delegation of power granted to the Board of Directors and approved by the Ordinary and Extraordinary General Meeting of Spineway (the “Company“) shareholders held on June 19, 2017, Spineway’s Board of Directors approved – on July 20, 2017 – the plan for an issue of 200 warrants (the “Tranche Warrants“), the exercise of which gives access to the issue of 200 notes redeemable in cash and/or convertible into new and/or existing shares (the “Notes“) with warrants to subscribe shares (the “Warrants“), representing a bond issue in the amount of €2M in favor of the YA II PN, LTD investment fund (the “Investor“), a fund managed by the US management company Yorkville Advisors, and empowered the CEO to decide to launch this transaction, approve its final terms and conditions, and issue the Tranche Warrants. Pursuant to an issuance agreement entered into today between the Investor and Spineway, the Investor has agreed to subscribe – during a period of 36 months as from the date of issue of the Tranche Warrants – up to 200 Notes with Warrants, representing a total par value of €2M, in several successive tranches (each referred to as a “Tranche“), which investor is not, however, intended to remain as Spineway capital in the long term. This issuance is subject to the transfer of the Spineway shares to the “Public Offering” compartment of Euronext Growth and obtaining prior approval from the Autorité des Marchés Financiers of the prospectus to be prepared by the Company by December 31, 2017, at the latest. Therefore, if this condition precedent is met, the issuance of the Tranche Warrants and subscription for the first Tranche should take place by the end of 2017. The purpose of the issuance of these Notes with Warrants is to provide Spineway with the financial means necessary to carry out its international-development plan and launch new innovative products. It could result in a capital investment of approximately €3.96M: €1.96M corresponding to the subscription of all the Notes and €2M corresponding to the exercise of all the Warrants. The Tranche Warrants are freely transferable to any other fund managed by Yorkville Advisors but cannot be transferred to a third party without the Company’s prior approval, shall not be the subject of a request for admission to trading on Euronext Growth and therefore shall not be listed. The Notes shall be issued in several Tranches. The aggregate principal amount of the first Tranche will be equal to €1M. The aggregate principal amount of each of the following Tranches shall, in principle, be equal to €0.5M, unless otherwise mutually agreed by the Investor and the Company. The Notes have a par value of €10,000 each and are subscribed at 98% of par. The Notes have a maturity of 12 months from their date of issuance. Upon maturity or an event of default(3), the Notes that have not been converted shall be redeemed by the Company at par (plus accrued interest, if any). The Notes do not bear interest (except in the event of default). At its discretion, the Investor may convert all or any of its Notes into new and/or existing shares (a “Conversion“). Upon a Conversion, the Investor shall determine the number of Notes to be converted and the corresponding aggregate principal amount and interest (if any) so converted (the “Conversion Amount“). The number of shares to be issued to the Investor upon each Conversion will be equal to the Conversion Amount divided by 92% of the Market Price (as defined below) on the Conversion Date. Upon a Conversion, the Company shall have the right at its sole discretion to remit to the Investor: (1) the corresponding new and/or existing shares (as described above), (2) the value in cash or (3) an amount in cash and new and/or existing shares. “C”: daily volume weighted average price of the Company’s share on the Conversion Date. The market price (the “Market Price“) shall be the lowest daily volume weighted average price of the Company’s share over the ten (10) consecutive trading days immediately preceding the applicable date (the “Pricing Period“). By way of exception, in the case of a Conversion, or upon exercise of Tranche Warrants on the Investor’s initiative, Pricing Period shall mean the trading days during which the Investor has not sold any share of the Company in the market among the ten (10) consecutive trading days immediately preceding the applicable date. The Notes, which are freely transferable to any other fund managed by Yorkville Advisors but cannot be transferred to a third party without the Company’s prior approval, shall not be the subject of a request for admission to trading on Euronext Growth and therefore shall not be listed. Each Note shall be issued with a number of Warrants equal to the par value of a Note divided by the applicable strike price of the Warrants (the “Strike Price“). The Warrants shall immediately be detached from the Notes and each Warrant shall give its bearer the right to subscribe for one (1) new share in the Company, subject to possible adjustments. The Strike Price of the Warrants attached to the Notes of the first Tranche shall be equal to 115% of the lower of (1) the Market Price on the issuance date of the Tranche Warrants (2) the Market Price on July 13, 2017, i.e., 3.2572 euros. The Strike Price of the Warrants attached to the Notes of the subsequent Tranches shall be equal 115% of the Market Price on the date of the applicable Request (or Tranche Warrant Exercise Date in the case of an exercise of Tranche Warrants on the Investor’s initiative). The Warrants shall be exercisable in new shares for a period of 5 years from their respective issuance dates. The Warrants, which are freely transferable to any other fund managed by Yorkville Advisors but cannot be transferred to a third party without the Company’s prior approval, shall not be the subject of a request for admission to trading on Euronext Growth and therefore shall not be listed, unless the Company and the Investor agree otherwise. The new shares issued upon conversion of the Notes and/or exercise of the Warrants shall be admitted to trading on Euronext Growth as from their issuance, will carry immediate and current dividend rights and will be fully assimilated to and fungible with the existing ordinary shares. The Company shall update a summary table on its website showing the Tranche Warrants, Notes, Warrants and number of shares outstanding. (1) assuming the exercise of all the dilutive instruments existing to date that could result in the creation of a maximum of 390,786 new shares. The Company specifies that, upon Conversion of the Notes, it shall have the right to remit a cash amount and/or existing shares instead of new shares in order to limit dilution for its shareholders. the Company will have a number of authorized and available shares equal to at least (i) 2 times the number of shares to be issued upon conversion of the Notes to be issued and outstanding (based on the conversion price applicable on the date of the Request) plus (ii) 1 time the number of shares to be issued upon exercise of the Warrants to be issued. the closing price of the Spineway share on the trading day prior to the Tranche Warrant Exercise Date is greater than or equal to €3.50. It is specified that if the closing price is between €3.50 (excluded) and €4.50 (included), the Investor may exercise up to 50 Tranche Warrants on its own initiative. If the closing price exceeds €4.50 (excluded), the Investor may exercise up to 100 Tranche Warrants on its own initiative. (3) Events of default include, in particular, the suspension of the listing of the Company’s shares (other than a suspension of less than five (5) consecutive days at the Company’s request) and the Company’s failure to remit shares or cash owed to the Investor pursuant to the terms of the Issuance Agreement. This press release is entered into in both English and French languages. In case of discrepancies, French language shall prevail. 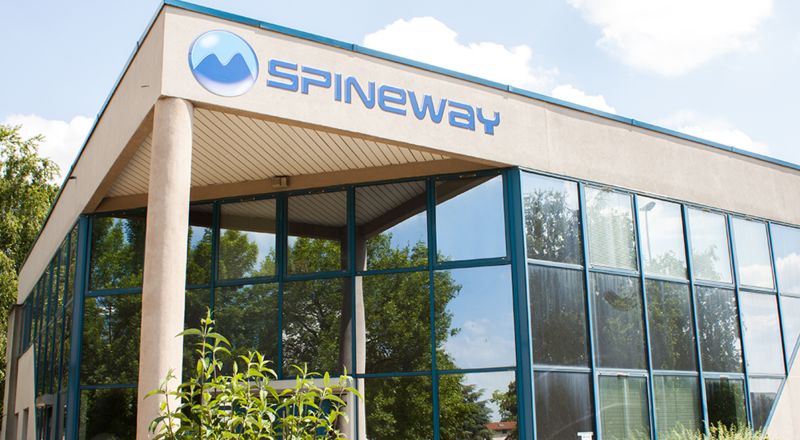 Spineway has an international network of over 50 independent distributors and 90% of its turnover comes from exports. Spineway, which is eligible for investment through FCPIs (French unit trusts specializing in innovation), received the OSEO Excellence award as well as the Deloitte Fast 50 award in 2011. Rhône Alpes INPI Patent Innovation Award (2013) – Talent INPI award (2015). Shelton, CT, July 28, 2017 –(PR.com)– Orchid Design (Orchid), a leader in innovative surgical device design, development and regulatory services for the orthopedic and spine industry, is pleased to announce the appointment of a new Director of Engineering for its Shelton, Connecticut design center. Poised for continued growth, Orchid has added Brandon Beckendorf to oversee the development of orthopedic and spine products for Orchid’s customers. Brandon comes to Orchid with strong product development experience in extremities, craniomaxillofacial, and sports medicine. Most recently, as the Director of Engineering at OsteoMed, he introduced lean product development, DFx, concurrent engineering, and a disciplined approach to project management to increase overall project performance. In his roles at both OsteoMed and Arthrex, Brandon developed a strong understanding of FDA regulations and product development know-how required for the global development of orthopedic implants and instruments. Brandon earned a ME and BS in Biomedical Engineering from Texas A&M University. “We are pleased to have Brandon join our team to continue to build on our 14 years of helping our customers launch innovative new products to help surgeon and their patients. His demonstrated leadership and product development expertise will expand our capabilities to drive new products to market for our customers,” Steve Maguire, General Manager, Orchid Design. Orchid Design, a division of Orchid Orthopedic Solutions, is the orthopedics industry leader in innovative surgical device design, development and regulatory submission services. Utilizing their ISO 13485 certified product development process, Orchid Design partners with device companies to help bring their ideas to life and streamline the pathway to commercial launch. The company has two design centers located in Shelton, CT and Memphis, TN, focused on the orthopedic medical device market. For more information about Orchid, visit the company’s website at www.orchid-ortho.com/about-orchid-design. Orchid is a worldwide leader in design and manufacturing for the orthopedic and medical device markets. Orchid is able to do this by compressing time to market, providing new technologies and being the best total supply-chain value. 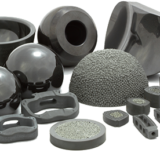 Orchid provides expertise in design and development, quality and regulatory support, implant manufacture, advanced machining, plastics technology, instrument manufacturing, implant coatings, surface treatments, and packaging services. With 14 world-class facilities located around the globe, Orchid continues to provide others an opportunity to live a better life through the products, services and the way the company conducts business. For more information about Orchid, visit the company’s website at www.orchid-ortho.com. GAINESVILLE, Fla.–(BUSINESS WIRE)–Exactech, Inc. (Nasdaq:EXAC), a developer and producer of bone and joint restoration products and biologic solutions for extremities, knee and hip, announced today that revenue for the second quarter of 2017 increased 2% to $67.3 million from $66.1 million in the second quarter of 2016, and 3% on a constant currency basis. Domestic revenue increased 2% to $45.7 million, and international revenue increased 1% to $21.6 million in the second quarter of 2017. Diluted earnings per share for the second quarter was $0.33 based on net income of $4.8 million, compared to second quarter 2016 net income of $4.4 million and diluted earnings per share of $0.31. Exactech CEO and President David Petty said, “For the first half of 2017, we reported a 4% increase in our revenue; however, excluding the impact of the divested spine products from the prior year we reported 7% growth in revenue during the first half of the year. Our hip revenue was negatively impacted by distribution transitions underway in certain markets outside the U.S. We continue to be pleased with the performance of our Extremities segment, which benefited modestly in the quarter from the pilot launch of the Vantage® ankle and also the Equinoxe® Preserve humeral stem. In terms of our product pipeline, additional pilot launches of the ExactechGPS® shoulder application, Alteon® H.A. hip stem and the Truliant® knee system are also going well. “During the third and fourth quarters we will be building inventory for these systems and hope to move into a limited launch late this year. Our channel development strategy remains important and will be enhanced as we more fully launch the Truliant knee system,” Petty said. Looking forward, Exactech narrowed 2017 revenue guidance to $267-$271 million and diluted EPS target to $1.25-$1.29, including the impact of the first quarter $0.02 diluted earnings per share costs related to the spine business transition. On an adjusted basis, the diluted EPS target is $1.27-$1.31. For the third quarter of 2017, the company anticipates revenues of $60.5-$62.5 million and diluted EPS of $0.23-$0.25. The foregoing statements regarding targets for the quarter and full year are forward-looking and actual results may differ materially. These are the company’s targets, not predictions of actual performance. The company will hold a conference call with CEO David Petty and key members of the management team, Friday, July 28th at 10:00 a.m. Eastern Time. The call will cover Exactech’s second quarter 2017 results. Mr. Petty will open the conference call and a question-and-answer session will follow. Based in Gainesville, Fla., Exactech develops and markets orthopaedic implant devices, related surgical instruments and biologic materials and services to hospitals and physicians. The company manufactures many of its orthopaedic devices at its Gainesville facility. Exactech’s orthopaedic products are used in the restoration of bones and joints that have deteriorated as a result of injury or diseases such as arthritis. 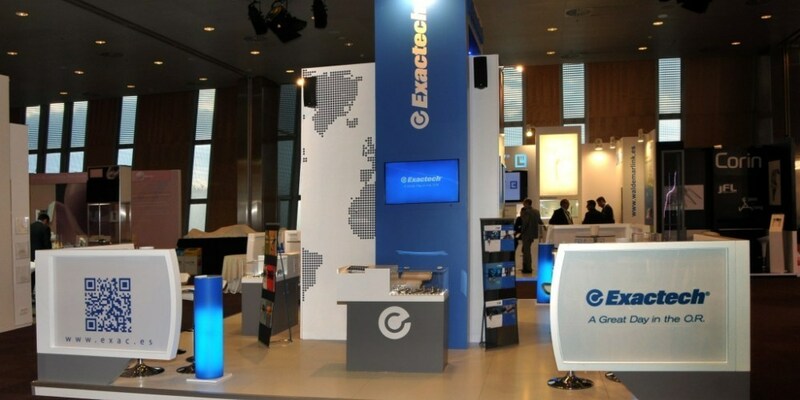 Exactech markets its products in the United States, in addition to more than 30 markets in Europe, Latin America, Asia and the Pacific. Additional information about Exactech, Inc. can be found at http://www.exac.com. Copies of Exactech’s press releases, SEC filings, current price quotes and other valuable information for investors may be found at http://www.exac.com and http://www.hawkassociates.com. An investment profile on Exactech may be found at http://www.hawkassociates.com/profile/exac.cfm. To receive future releases in e-mail alerts, sign up at http://www.hawkassociates.com/about/alert. We present certain non-GAAP results as a supplement to our financial results based on GAAP, as we believe it is useful to exclude certain items in order to focus on what we regard to be a more reliable indicator of the underlying operating performance of our business. Because we operate internationally, we present the percentage change in sales by reporting segment on a constant currency basis, which is a non-GAAP financial measure. We calculate this change on a constant currency basis by translating current period sales at the comparable average historical exchange rates for the same period in the prior year. We believe that presenting the percentage change in sales on a constant currency basis assists in the understanding of actual sales fluctuations by excluding the impact of foreign currency fluctuations. 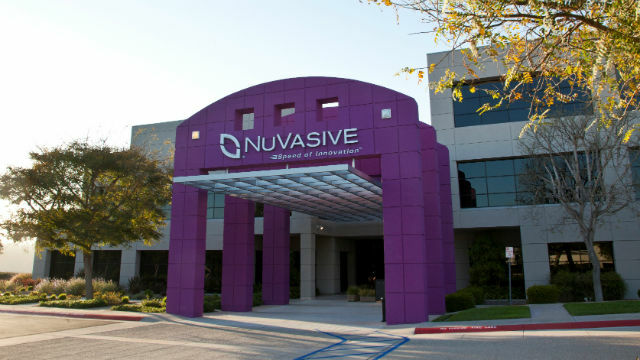 SAN DIEGO, July 27, 2017 /PRNewswire/ — NuVasive, Inc. (Nasdaq: NUVA), a leading medical device company focused on transforming spine surgery with minimally disruptive, procedurally-integrated solutions, announced today financial results for the quarter ended June 30, 2017. Company reiterates revenue, non-GAAP operating margin and non-GAAP diluted earnings per share guidance for 2017. NuVasive reported second quarter 2017 total revenue of $260.6 million, a 10.3% increase compared to $236.2 million for the second quarter 2016. On a constant currency basis, second quarter 2017 total revenue increased 10.7% compared to the same period last year. For the second quarter 2017, both GAAP and non-GAAP gross profit was $194.2 million, while both GAAP and non-GAAP gross margin was 74.5%. These results compared to GAAP and non-GAAP gross profit of $176.5 million and $183.8 million, respectively, and GAAP and non-GAAP gross margin of 74.7% and 77.8% respectively, for the second quarter 2016. Total GAAP and non-GAAP operating expenses were $164.4 million and $151.7 million, respectively, for the second quarter 2017. 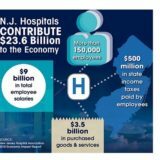 These results compared to GAAP and non-GAAP operating expenses of $116.4 million and $146.4 million, respectively, for the second quarter 2016. 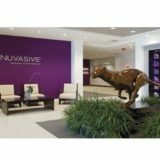 NuVasive reported a GAAP net income of $12.7 million, or $0.22 per share, for the second quarter 2017 compared to $30.2 million, or $0.57 per share, for the second quarter 2016. On a non-GAAP basis, the Company reported net income of $24.1 million, or $0.46 per share for the second quarter 2017 compared to $20.6 million, or $0.40 per share, for the second quarter 2016. Cash, cash equivalents and short and long-term marketable securities were approximately $130.9 million at June 30, 2017. The Company reiterated full year 2017 financial guidance in line with prior expectations, with the exception of the impact of updated foreign exchange rates. Current guidance reflects guidance provided July 27, 2017.
the impact of currency over the same period in the prior year. Adjusted EBITDA margin of 26.7%, an increase of 150 basis points compared to 25.2% for 2016. Prior guidance provided April 25, 2017. Current guidance reflects guidance provided July 27, 2017. Effective tax expense rate of ~34% applied to GAAP earnings and ~35% applied to Non-GAAP earnings. Effective tax expense rate of ~33% applied to GAAP earnings and ~35% applied to Non-GAAP earnings. Costs related to acquisition, integration and business transition activities which include severance, relocation, consulting, leasehold exit costs, third party merger and acquisitions costs and other costs directly associated with such activities. Represents costs associated with non-cash purchase accounting adjustments, such as acquired inventory fair market value adjustments, which are amortized over the period in which underlying products are sold. Excludes the amortization associated with non-controlling interest. The impact on results from taxes include tax effecting the adjustments above at the statutory rate as well as taking into account discrete items and including those discrete items in the annual effective tax rate calculation. The Company also includes those adjustments that would have benefited the tax rate in lieu of the above adjustments as part of the Company’s tax filings. The impact of the changes to the tax rate results in an annual estimated rate of ~35% on a non-GAAP basis. Interest (income) / expense, net for the quarter and year ended December 31, 2016 includes loss on extinguishment of debt for $1.6 million and $19.1 million, respectively. Management uses certain non-GAAP financial measures such as non-GAAP earnings per share, non-GAAP net income, non-GAAP operating expenses and non-GAAP operating profit margin, which exclude amortization of intangible assets, purchase accounting related charges, leasehold related charges, integration related expenses associated with acquired businesses, one-time restructuring and acquisition related items, CEO transition related costs, certain litigation charges, non-cash interest expense and/or losses on convertible notes, and the impact from taxes related to these items, including those taxes that would have occurred in lieu of these items. Management also uses certain non-GAAP measures which are intended to exclude the impact of foreign exchange currency fluctuations. The measure constant currency is the use of an exchange rate that eliminates fluctuations when calculating financial performance numbers. The Company also uses measures such as free cash flow, which represents cash flow from operations less cash used in the acquisition and disposition of capital. Additionally, the Company uses an adjusted EBITDA measure which represents earnings before interest, taxes, depreciation and amortization and excludes the impact of stock-based compensation, purchase accounting related changes, leasehold related charges, integration related expenses associated with acquired businesses, CEO transition related costs, certain litigation liabilities, acquisition related items and other significant one-time items. Management calculates the non-GAAP financial measures provided in this earnings release excluding these costs and uses these non-GAAP financial measures to enable it to further and more consistently analyze the period-to-period financial performance of its core business operations. Management believes that providing investors with these non-GAAP measures gives them additional information to enable them to assess, in the same way management assesses, the Company’s current and future continuing operations. These non-GAAP measures are not in accordance with, or an alternative for, GAAP, and may be different from non-GAAP measures used by other companies. Set forth below are reconciliations of the non-GAAP financial measures to the comparable GAAP financial measure. Excludes the impact of dilutive convertible notes and warrants for which the Company is economically hedged through its anti-dilutive bond hedge arrangements. Costs related to acquisition, integration and business transition activities which includes severance, relocation, consulting, leasehold exit costs, third party merger and acquisitions costs and other costs directly associated with such activities. NuVasive will hold a conference call today at 4:30 p.m. ET / 1:30 p.m. PT to discuss the results of its financial performance for the second quarter 2017. The dial-in numbers are 1-877-407-9039 for domestic callers and 1-201-689-8470 for international callers. A live webcast of the conference call will be available online from the Investor Relations page of the Company’s website at www.nuvasive.com. After the live webcast, the call will remain available on NuVasive’s website through August 28, 2017. In addition, a telephone replay of the call will be available until August 3, 2017. The replay dial-in numbers are 1-844-512-2921 for domestic callers and 1-412-317-6617 for international callers. Please use pin number: 13665648. NuVasive cautions you that statements included in this news release or made on the investor conference call referenced herein that are not a description of historical facts are forward-looking statements that involve risks, uncertainties, assumptions and other factors which, if they do not materialize or prove correct, could cause NuVasive’s results to differ materially from historical results or those expressed or implied by such forward-looking statements. In addition, this news release contains selected financial results from the second quarter 2017, as well as projections for 2017 financial guidance and longer-term financial performance goals. The numbers for the second quarter 2017 are prior to the completion of review procedures by the Company’s external auditors and are subject to adjustment. In addition, the Company’s projections for 2017 financial guidance and longer-term financial performance goals represent current estimates, including initial estimates of the potential benefits, synergies and cost savings associated with acquisitions, which are subject to the risk of being inaccurate because of the preliminary nature of the forecasts, the risk of further adjustment, or unanticipated difficulty in selling products or generating expected profitability. The potential risks and uncertainties that could cause actual growth and results to differ materially include, but are not limited to: the risk that NuVasive’s revenue or earnings projections may turn out to be inaccurate because of the preliminary nature of the forecasts; the risk of further adjustment to financial results or future financial expectations; unanticipated difficulty in selling products, generating revenue or producing expected profitability; the risk that acquisitions will not be integrated successfully or that the benefits and synergies from the acquisition may not be fully realized or may take longer to realize than expected; and those other risks and uncertainties more fully described in the Company’s news releases and periodic filings with the Securities and Exchange Commission. NuVasive’s public filings with the Securities and Exchange Commission are available at www.sec.gov. The forward-looking statements contained herein are based on the current expectations and assumptions of NuVasive and not on historical facts. NuVasive assumes no obligation to update any forward-looking statement to reflect events or circumstances arising after the date on which it was made. Net income attributable to NuVasive, Inc.
SAN DIEGO, July 27, 2017 /PRNewswire/ — NuVasive, Inc. (NASDAQ: NUVA), a leading medical device company focused on transforming spine surgery with minimally disruptive, procedurally-integrated solutions, today announced a new organizational structure to drive the Company’s growth and profitability goals, supporting its strategy to help deliver safer, more predictable spine surgery. Transform global operations to drive operational efficiencies through the combination of manufacturing, supply chain, information technology (IT), regulatory affairs and quality assurance (RA/QA). Matt Link, president, U.S. Commercial is being promoted to a key leadership role as executive vice president, Strategy, Technology and Corporate Development, a newly created position to further drive the Company’s innovation agenda. Mr. Link is a long-tenured NuVasive executive with more than 15 years of industry experience, including extensive knowledge of the U.S. spine marketplace, as well as surgeon and hospital dynamics. In this role, he will lead product and systems development, global marketing, surgeon education, clinical research and corporate development. 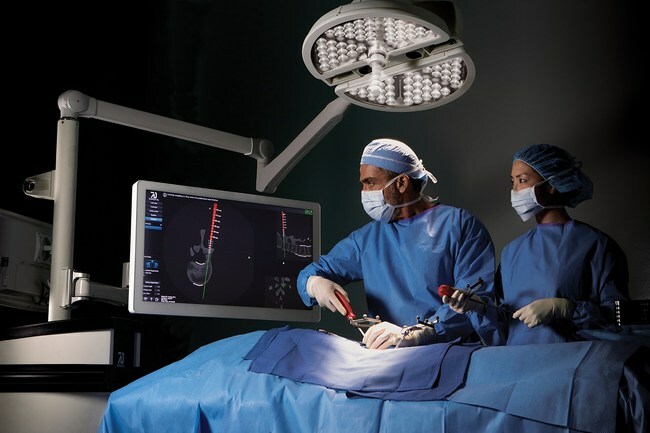 Mr. Link’s experience in surgeon requirements and commercial operations will be key as NuVasive continues to bring leading innovation to market. Skip Kiil, executive vice president, International is named executive vice president, Global Commercial. Mr. Kiil joined NuVasive in June and has more than 15 years of experience as a global medical technologies and life sciences business leader. He was previously with Alcon, a division of Novartis Corporation, where he most recently served as surgical head, Europe, Middle East, Africa and Russia. He is a proven leader in managing and growing complex, global commercial enterprises internationally and domestically within the healthcare and spine technology industries. His strategic and operational expertise in market entry and development are critical as NuVasive seeks to double its International market share in the coming years and further expand the Company’s position in the U.S. marketplace. Steve Rozow, vice president, Global Operations, assumes an elevated role as executive vice president, Global Process Transformation, including IT and RA/QA, in addition to his current Global Operations responsibilities. Since joining NuVasive in 2015, Mr. Rozow has led improvements in supply chain and fulfillment, as well as the successful development of the Company’s new manufacturing facility in West Carrollton, Ohio. Mr. Rozow is an experienced medical device leader including more than 20 years with Zimmer, where he served in various manufacturing and operational leadership roles. His position is critical as the Company focuses on scaling global operations and driving operational improvement initiatives. Unrelated to the organizational updates announced today, the Company has accepted the resignation of its chief financial officer, Quentin Blackford, effective August 25, 2017. Mr. Blackford is pursuing another opportunity outside the spine industry and has agreed to remain with the company during this transition period. Mr. Blackford’s resignation is not the result of any dispute or disagreement with NuVasive, including any matters relating to the Company’s accounting practices or financial reporting. Vickie Capps, in her role as an independent member of NuVasive’s board of directors and a member of the audit committee, will provide guidance and support to the Company’s financial organization during the transition period. 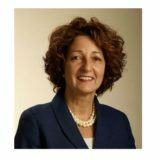 Ms. Capps is a well-respected financial executive, having served as CFO of DJO Global, as well as CFO of several public and private companies. Ms. Capps will also assist the Company in its search for a successor to Mr. Blackford. “Since becoming CEO over two years ago, I have been working with our board to build a world-class leadership team to support our revenue growth and profitability goals. Together, we are executing against our 5-year strategic plan and building a deep bench of talent, positioning us well to execute against our short- and long-term initiatives. I remain more confident than ever in our Company’s position to take on the next $1 billion in growth,” said Lucier. The orthobiologics global market is anticipated to grow from $ 6596 million in 2016 to $ 12019 million by 2025. The market is expected to grow at a CACR of 6.97% between 2017-2027. The base year considered for the market study is 2016. The forecast period is 2017-2025. Evolvement in orthobiologics has led to the development of tissue regeneration products and bone grafts that minimize hospital visits, stays and bone healing process. The global orthobiologics market is segmented on the basis of product type, application, end-user, and geography. The global orthobiologics market by product type is segmented into the demineralized bone matrix (DBM), allograft, bone morphogenetic protein, viscosupplementation, synthetic bone graft substitutes, stem cell therapy and others. The application segment is further bifurcated into spinal fusion, trauma repair, and reconstructive surgery and others. The end-user is segmented into hospitals and clinics. The orthobiologics market by geography is classified into North America, Europe, Asia-Pacific and rest of the world. The rise in the demand for spinal fusion surgeries, development in Strategic Partnerships, and growth in Orthobiologics Material are the major drivers for the global Orthopedics market. Healthcare reforms (such as Stark self-referral law and fraud & abuse law) are estimated to have affected the Orthobiologics surgeons. Bone Regeneration Technology, Larger Spend on Healthcare is the major opportunities in the Orthobiologics Market. WAYNE, Pa., July 27, 2017 /PRNewswire/ — Camber Spine Technologies, today announced that they have exceeded 150 implantations of the ENZA™ Zero-Profile ALIF device that was launched last July. ENZA™ was designed to increase patient safety by minimizing retraction necessary for implantation of the device, utilizing its integrated fixation. It is often described as “designed for the access surgeon” because of its completely inline instrumentation–which relieves the burden that other systems induce by requiring larger retraction to accommodate angled instrumentation. This achievement comes at an inflexion point for Camber Spine, as they continue to expand sales into new territories of the U.S with new hires. 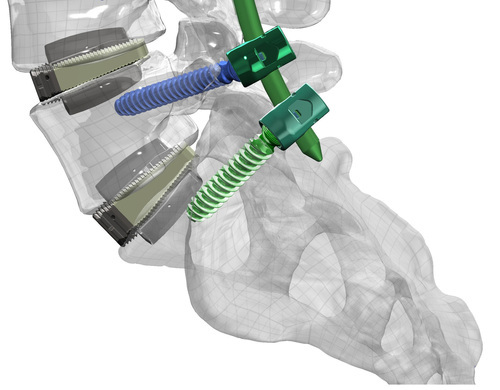 The Camber Spine Technologies ENZA™ MIS Zero-Profile Anterior Interbody Fusion is indicated for use with autogenous bone graft in patients with degenerative disc disease (DDD) at one or two contiguous levels from L2 to S1. These implants may be implanted via a laparoscopic or an open anterior approach. The Camber Spine Technologies’ ENZA™ MIS Zero-Profile ALIF is intended to be used with additional FDA-cleared supplementary fixation systems. Camber Spine Technologies, LLP, is a fast-growing musculoskeletal implant company founded in 2010 bringing innovative, best-in-class products to the market, providing surgeons and their patients with better treatment options. The company is committed to delivering surgeon inspired new technologies to the spine market. Camber is an ISO 13485 certified medical device company. Camber Spine Technologies, located in Wayne, Pennsylvania, markets a line of proprietary musculoskeletal products nationwide through its exclusive distributor, S1 Spine. For further information please visit www.cambermedtech.com . For inquiries about ENZA® or distribution opportunities please call 484.427.7060.